Seams, by definition, are the glue joints where the top table and the back table are jointed and glued to the ribs. Seam openings are not what I consider a repair, but rather a normal maintenance on any instrument that is properly glued together with conventional water soluble glues. Seams do periodically open due primarily to changes in climatic conditions and internal stress within the instrument. Adverse playing conditions or mal-treatment of an instrument can certainly also be a contributory factor for this maintenance occurrence. 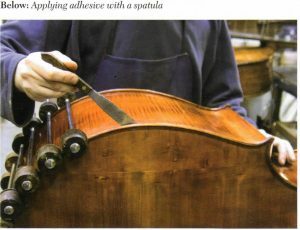 As a generality, most repairmen and makers would agree that the top table of the instrument should be glued to the ribs with a diluted or watered down hide glue solution. The purpose for this is not to create additional repair work. It is to allow the bass to expand and contract safely. If an instrument develops internal tension, again possibly due to humidity and temperature changes, it is so much more preferable to have a seam unglue. The undesired alternative would be for this internal stress within the bass to find a weakness in the graining on the top, thus creating a stress crack or a weather crack. Conversely, the back table is usually glued with a much stronger solution or mixture of glue. The constructive philosophy behind this is that the back is of a harder, more substantial wood and less susceptible to cracking. 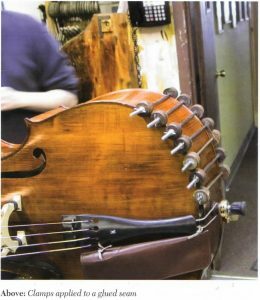 It is also a fact that there is a great deal of movement in the back table when the Bass is being played, pushing the column of air within the instrument out of the F-holes. This is much like a speaker cone forcing sound out of a speaker cabinet. Thus, a stronger mixture is utilized to keep the back from opening. This is not to say that a back never develops an open seam. Some of the most disturbing buzzes, which you would think is definitely a loosened bass bar, has actually been caused by this simple culprit. Closing a seam is a minor and usually inexpensive repair. To restore a top or back crack is not only a much more extensive and costly repair, but more importantly can result in the permanent depreciation of the value of an instrument, depending upon the nature of the damage. Seam repair is a basic procedure, performable by virtually player and luthier, as long as there aren’t any complications that involve the condition of the bass being repaired. It is not advisable for a player to attempt to repair an open seam if the edges of the bass are quite fragile. Nor is it advisable that this repair be attempted by anyone other than a qualified repair person if there are other damages to the bass in conjunction with the open seam. The basic procedure of Seam repair is to first locate the open seam by tapping the edges or using a thin probe to ascertain the openings. Next, wash out the open seam by dissolving the dried out pre-existing glue that is in the seam. If this is not properly accomplished and the seam is clamped, damage to the plate (top or back) could occur due to the clamping onto the existing dried out glue. 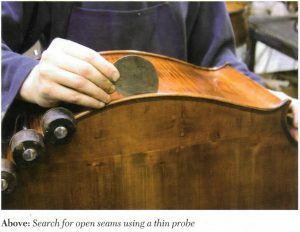 This could compare in much the same manner as clamping the top or back closed with a small pebble in the seam and can result in detrimental structural damages to the instrument that might include severe cracking to the top or back table and not allowing the seam to be properly jointed to the ribs. The procedure of washing the seam out properly entails the suggested use of a tooth brush and hot water. Hot water is carefully applied to both the glue surface of the top or back table and the ribs surface. The old glue is gently scrubbed and dissolved by the use of the tooth brush. It must be noted that it is imperative that very little water be induced to the open seam joint, as too much water will result in the water literally running down the inside surface of the top or back tables….not a desirable situation. Once the seam is thoroughly prepared for gluing and clamping, then apply a small amount of water soluble hide glue (either diluted with water for use on the top seam, or stronger mixture of glue for the back seam) by the use of a thin spatula knife. Apply the necessary clamps to the glued open seam, placing the clamps approximately 1 inch (approximately 25mm) apart from each other. As with the application of hot water to clean out the old glue of the open seam, the application of new glue to the prepared seam must be accomplished conservatively. If too much glue is applied to the seam opening, this excess glue will run down the interior surface of the top or back tables. 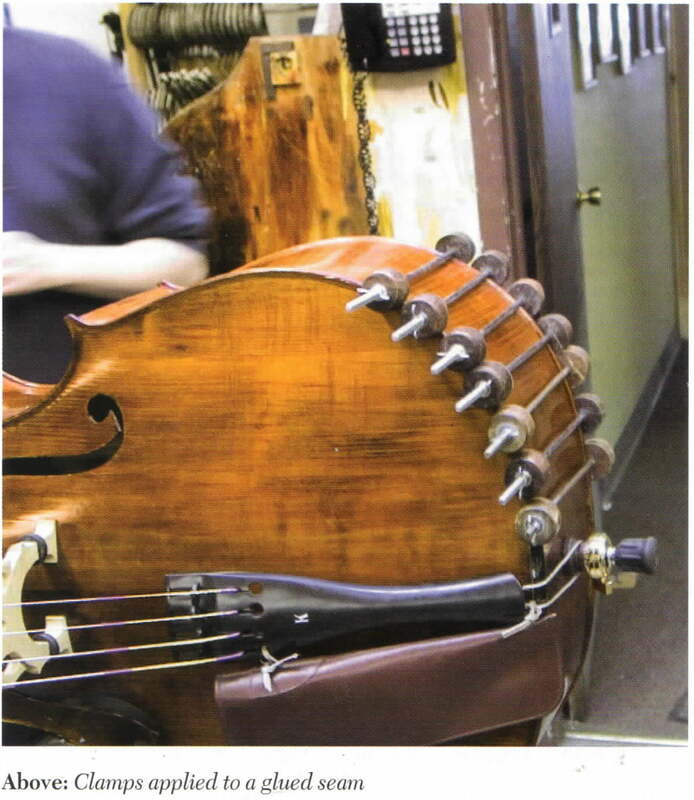 The complication of excess glue runs on the interior surface of the top or back tables can result in possible buzzing within an instrument due to sympathetic vibrations. With seam repair, it is essential to clean up the excess glue and gently clamp the open seam. A key to a successful seam repair without causing unnecessary cleanup or varnish touch up is to work meticulously. All excess glue should be washed off while it is wet, making certain no water or glue gets between the clamps and the top or the back. 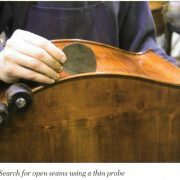 This could cause the clamps to stick to the instrument, causing potential varnish damage. Properly made professional spool clamps are designed with leather pads between the clamp and the top or back. 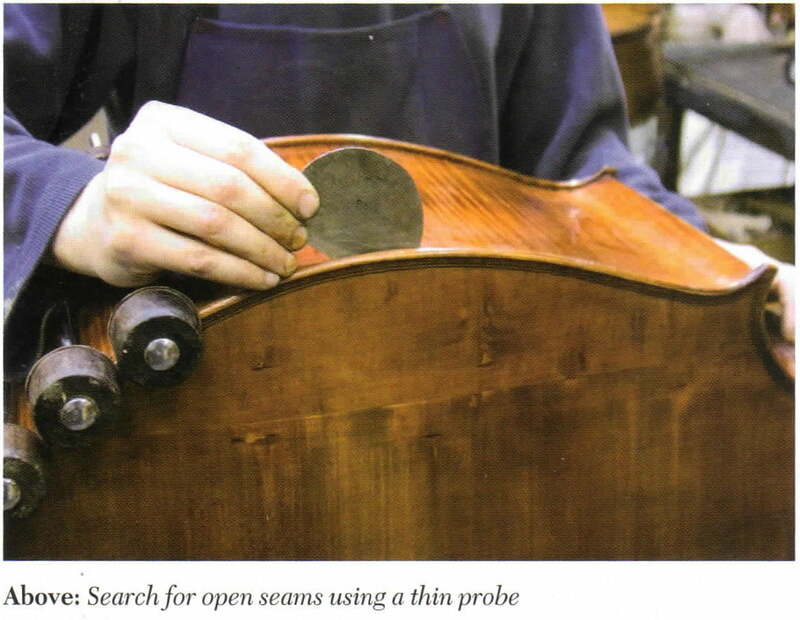 The leather will become glued to the instrument rather than the clamp, thus reducing the risk of damage to the varnish of the instrument. Open seams is one area of repair where the player can handle most situations. I often do educational demonstrations for musical educators on proper seam repair procedures with much success in training procedures in a relatively short period of demonstration time. Fortunately, there exists several commercially available seam repair kits including several with spool clamps, application knife and water soluble hide glue. However, the player again must yield to his better judgment as to when the right time to accomplish this level of repair or when it is time to put the repair in the hands of a professional. Rule of thumb, “When in doubt – allow a professional to handle the problem”.